They're worried about immigration, disgusted with political correctness and ready to embrace deal-making. Sandra Combs, an “educational entrepreneur” in Kapaa, Kauai, spent two hours at the caucus location in her neighborhood Tuesday night. Like many people there, she voted for Donald Trump. 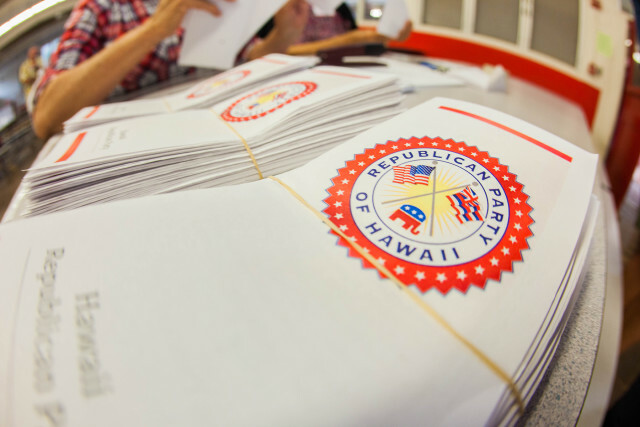 The New York businessman received 97 of the 227 votes cast in Kapaa on his way to winning statewide with 42 percent of the vote to 33 percent for Sen. Texas Ted Cruz, who finished second. Some political observers wondered how a candidate who has insulted so many — women, minorities, veterans, the physically challenged, entire countries — and bragged so much could so easily prevail in an island state that is said to revere respect, tolerance and modesty. 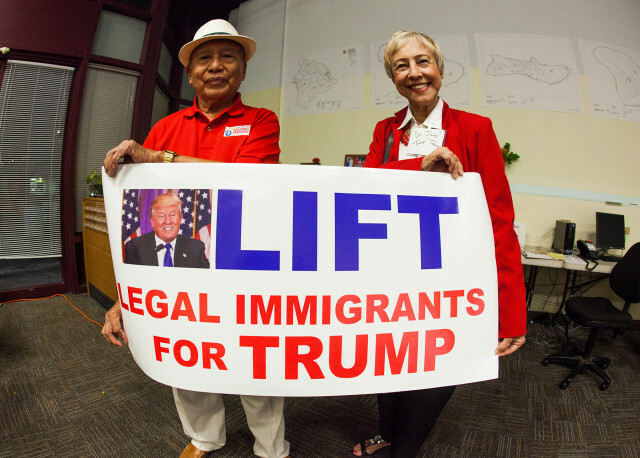 Emmanuel Tipton and Judy Franklin show their colors at Hawaii Republican Party headquarters in Honolulu on Tuesday night. Based on interviews with some of his Hawaii supporters Wednesday, Trump seems to have won here for the same reasons he is winning the GOP battle nationally: fear of unchecked immigration, loathing of the establishment, desire for an outsider to shake things up in Washington, rejection of political correctness, confidence in business skills and a new embrace of the seemingly lost art of deal-making. One of the Trump campaign’s co-directors here, Sutton said his candidate drew not only Republicans but Democrats and independents. While the numbers are still being tallied, Sutton, who was among those helping out at Republican Party headquarters Tuesday night, estimated that at least 15,000 people voted, a 50 percent increase over the 2012 caucus. Sutton said it motivated Trump supporters to work on voter turnout, especially to counter an aggressive, organized Cruz campaign. 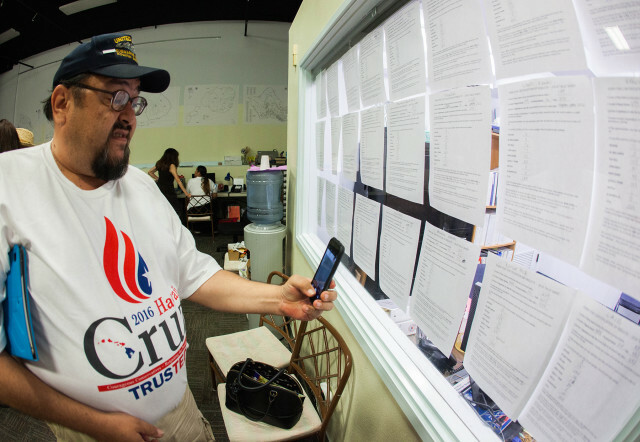 Supporters of Ted Cruz were also on hand at GOP headquarters Tuesday night. The reason Trump ultimately prevailed was simple, Sutton said. What Trump brings to voters is a candidate not beholden to donors, said Sutton, and one who is not afraid to hit back when attacked. Kimo Sutton’s wife, Christine, said Trump won here because of a desire for reform of health care, immigration, the Veterans Administration and trade. “We need to do things to make the cost of living less here in Hawaii, and if that means going after the Jones Act, I think Donald would be the one to work on it,” she said. The Jones Act is the Merchant Marine Act of 1920 that supporters (usually Democrats) say protects American jobs and opponents (usually Republicans) say limits competition and drives up consumer prices. Christine Sutton’s biggest concern is immigration. She recalled how her ancestors came from Europe to Ellis Island in New York City at the turn of the 19th century. She said a screening process meant that some immigrants were turned away, for reasons such as poor health. 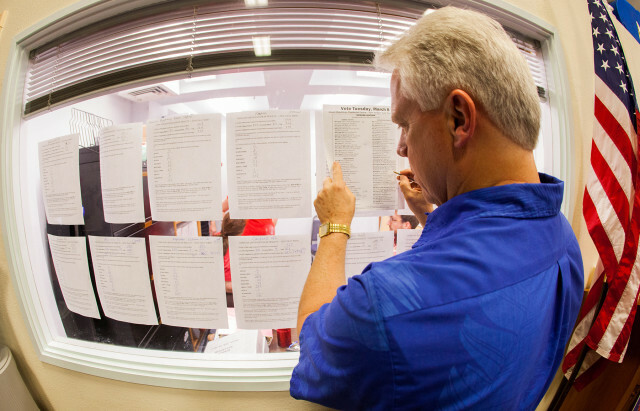 GOP Party Chair Fritz Rohlfing posting the latest results Tuesday night. There are few checks on immigration today, she said, and in her industry — she works at Queen’s Medical Center — she said she sees recent immigrant groups such as Micronesians taking advantage of the services available to them in the islands. She acknowledged that the U.S. has a historical relationship with Micronesia that justifies their visa-free status, but she feels it has gotten out of hand. Asked about Trump’s use of coarse language and insults, she said he is simply speaking what a lot of people feel. One way to do that is to address burning issues in Hawaii. 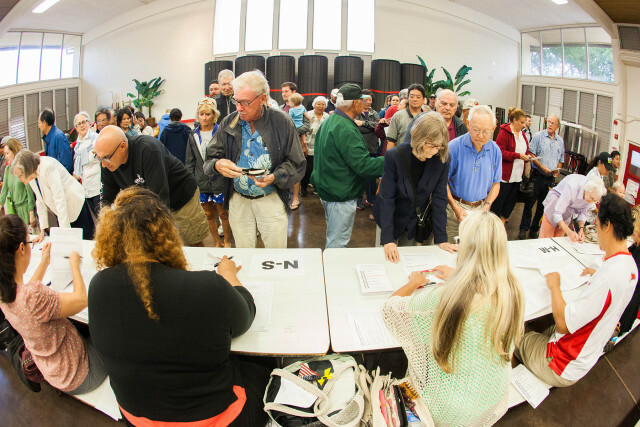 Republican voters cast their ballots at Kalani High School on Oahu. What are the plans? Paikai gives out a web address: DonaldTrump.com. What about aloha? Does Trump have aloha? Franklin is Paikai’s wife and along with her husband was one of the three Trump supporters who signed the ballot registration for the local caucus and paid for it with $5,000 from the national campaign. 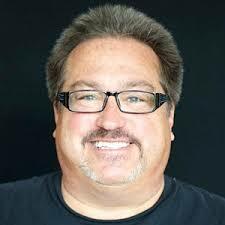 “I think the American people are fed up with the way things are going in the government right now, and they want a fresh approach that returns us to our Christian-Judeo values,” said Franklin, who is a minister. What the country needs, said Franklin, is someone who is “strong and focused” — the same qualities needed to be successful in business — and to honor a separation of powers among the three branches of government. Franklin admitted that she is sometimes put off by what Trump says. Ballots await the voters Tuesday night. “I don’t always like the way he says certain things, but I appreciate that he speaks honestly,” she said. Like her husband, she also said Trump embodies aloha. And, though Trump has marketed wine with his brand, she admires that Trump neither smokes nor drinks and said the Bible is his favorite book. “I want someone who is clear-headed,” she said. Di Rocco believes that Trump really will make the country great again. His old television show, “The Apprentice,” illustrates Trump’s insight and understanding of people and of business, and what translates into success. Asked about the provocative things Trump says, Di Rocco said the candidate is raising important points that need to be discussed. This includes the idea of putting a halt to the immigration of Islamic people to the U.S. In Di Rocco’s view, the Koran does not treat woman and other religions well. The gathering of people enthusiastic for change reminded her of a scene near the end of “The Hunt for Red October,” when Alec Baldwin says to Sean Connery that there will be “hell to pay” in Moscow over the defection of a nuclear submarine. Every time someone attacks Trump, calling him a Nazi or worse, King said it only emboldens his supporters who feel that they are being attacked. People like King just want to feel proud of their “exceptional” country again. It’s worked for his campaign, after all. King, who will be a Hawaii delegate to the national GOP convention in Cleveland this summer, is having the time of her life. She said she can’t wait until the FBI indicts Hillary Clinton, too.